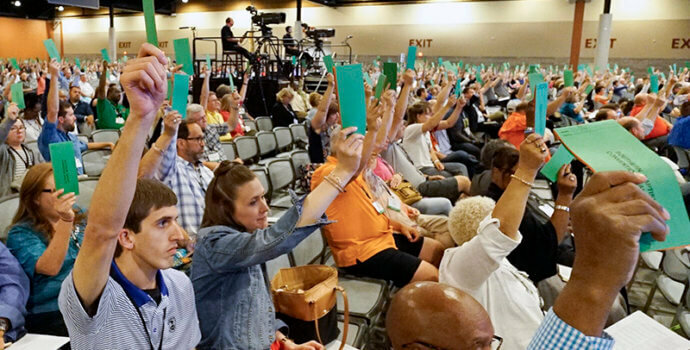 In recent days I submitted to the Southern Baptist Convention’s Resolutions Committee a resolution entitled On Affirming the Dignity of Women and the Holiness of Ministers. Though I am responsible for the resolution and its submission, in order to speak as loudly as possible, I invited my fellow SBC entity heads to participate, as well as SBC president Dr. Steve Gaines. In order to heighten awareness going into Dallas, I elected to make it public now. Dr. Paul Chitwood, executive-director of the Kentucky Baptist Convention, reached out to all of the SBC state executives. Dr. Ronnie Floyd, pastor of Cross Church in Northwest Arkansas, reached out to past presidents of the Southern Baptist Convention as well as the conference of Mega Metro pastors. I am also grateful both of this year’s candidates for the SBC presidency, Ken Hemphill and J.D. Greear, have also signed on. Readers should view these names not as formal co-submitters of this resolution, but as people who resonate with it and desire to express their convictions accordingly. I’m gratified so many have signed on as I believe it’s a powerful statement of conviction to the world and to our convention, and of remorse and accountability to God and man. Moreover, as it is a call to protect, support, and honor women, I directed my wording and the initial invitation list towards men. Below you will see names from these different groups listed as well as many other additional names. Frankly, since word began to spread of the resolution and the groundswell of support behind it, I’ve been inundated with people requesting to add their names. The resolution is not a petition and, though this did not begin as a “sign up” effort, my inbox is too full of requests to not make it available to all who share and desire to express these convictions. All who would like to add their name and express convictional and covenantal solidarity with the resolution may do so by clicking on the button at the end of this article. However, before you sign it know this resolution is intended to be more than a statement of public witness. It is a statement of public accountability. Before God, we are first and foremost covenanting with ourselves anew to be people of integrity, to honor, protect, and to serve women, and to guard our hearts, minds, and marriages in Christ Jesus. If we do not have the courage of our convictions to speak with clarity on these issues, we have no credibility to speak to our culture on other issues. I understand (from those outside the Resolutions Committee) that other resolutions on abuse and the treatment of women have been submitted. The Resolutions Committee may take up my resolution, other resolutions, draft their own resolution, or choose to go an altogether different route. I have full confidence in that group and am supportive of how they choose to proceed. Annually, the Resolutions Committee has a difficult job without others, including me, complicating it all the more. Yet, as for me I want to be on record on these issues, as do many, many others. When the gossip, posturing, and drama all fade away, these issues are remarkably simple, at least they ought to be: as ministers, we are called to guard our hearts and protect our people. As to the treatment of women, this is not difficult. Whether it be our mothers, wives, daughters, sisters in Christ, or an anonymous woman on the street, every woman is created in the image of God. As men, we are called to demonstrate biblical valor and virtue towards women. We are called to serve, honor, and protect them. Most especially, Christian men are to lead, love and sacrifice for their wives just as Christ has done for the church. To act in any other way is to reject biblical teaching as well as common civility and decency. As to abused women, this is not difficult: we are to protect them from those who would do them harm and to remove them from the place of harm. We can work against our matrimony-shattering “no-fault” divorce culture and shore up marriages. But this needed work never means asking women to suffer abuse. Yes, God through our prayers and the power of the gospel can change even the vilest abuser, but wives aren’t called to endure suffering from his hand in the meantime. As to the minister’s holiness, this is not difficult: we are charged to guard our life and our doctrine. As Southern Baptists, we have excelled in the latter, but not so much the former. The character qualifications for ministry as outlined in 1 Timothy 3:1-7 are not a onetime threshold to cross. They represent an ongoing accountability to God’s Word and God’s people. All this informs the resolution below On Affirming the Dignity of Women and the Holiness of Ministers. May the Lord give the resolutions committee—a group in whom I have full confidence—wisdom as they take up this resolution. But, more importantly, may the words carry import in our lives and in our ministries. In difficult times, let us move ahead in hope and conviction. Dr. Allen, Thank you for the clear language on this matter in our day. Thank you, Jason. Well said. Count this as my signing on. Amen! Such a blessing to see this in print. Many men have shown great respect for women, but I hope this will be a strong commitment for everyone, even those who need a fresh start. I agree with every part. Please see this as me signing on. Actually Victoria, I like the statement but felt just the opposite. The last clause needs precise clarity as to the role of Pastor/Elder being Biblically explicitly given to men. If that troubles you, your problem is with the authority of God’s Word. Well. That’s the issue, isn’t it? What is available to women besides pastor and elder? Scripture (1 Cor 11:5) mentions women and public prayer and prophesy. I don’t see any of that Sunday morning. I think the defacto involvement in Sunday morning worship for women has just been singing. We haven’t even madr any room for what’s biblically available. > Elizabeth, The apostle Paul’s letter to Titus (chapter 2) gives specific instruction as regards the role of women in teaching and ministering to each other, especially as we seek to fulfill our God-given helper roles in home and church, not to mention the need for discipleship that all the women who come into the Kingdom later in life have. There is need to love and serve one another in the church, to bear one another’s burdens, to encourage each other on to good works, toward growth in grace and in the knowledge of Christ Jesus in the day to day. There is a tremendous need for women who know and love the Lord and His people and who understand His Word and can teach it and apply it to women as they seek to be godly wives, mothers, daughters, employees, businesspeople, and fellow image-bearers of Christ. The life of the church is far more than the corporate assembly of the saints for Lord’s Day worship. Please don’t devalue the women and children (the next generation of the Kingdom) by implying that a woman can’t meet her full potential unless she leads men. God in His wisdom is gracious and good. I am thankful beyond words for the cleansing that is taking place so that we all can be better equipped to face the spiritual battles that we face. There is no shortage of need for women to minister to women, under the authority of God-given shepherds, for the glory of Christ’s Kingdom – with love, a PCA sister with an SBC daughter. Very well said Dr. Allen. Thank you for composing this resolution. As a woman, leader of a Christian mental health organization, former staff member of an SBCchurch, I am grateful this has been articulated and grieved it is necessary. This resolution solely levels the ground for a new foundation. Leadership is gender less. Authority is assigned. Followership is offered and not guaranteed. Men are not women’s “heads” solely by virtue of their manhood. Headship is positionally assigned. Father, husband, pastor not brother, co-worker (even if ordained), or guy on the street. Some women are gifted to lead and some men are wise enough to view that as a benefit not a threat. I pray the SBC broadens their thoughts on these topics. The future is in the balance. This is wonderful! Count this as my signing in. I agree. However, I pray we do not become confused between respecting all women and the role of men that Jesus established. We women have a major role in ministry as teachers, bible study leaders, mentors etc. but men are to be the christian leaders of the family and this is a reflection of Christ as head of the church. Also, I pray that we do not get caught up in the worlds battles as we are not to think as the world. It’s about love and respect – Jesus’ way. When will the SBC acknowledge that abuse with in their churches stems from the belief the men are superior? Thank you for making a clear resolution in fact and not emotional language. Neither pandering to a feminist agenda, nor continuing to allow for secret and destructive sin amongst the ministry. Laura Brown ,I salute you.The church today is slowly moving away from the teaching of the bible towards the world’s standard.Revenging and avenging are becoming rife and yet God says it is his to revenge. Resolutions are made on the basis of the world rather than on scripture. God have mercy on us !!!!! Are the men who signed on as supporters of this resolution, in addition to Dr Allen, intending for this to be their blanket apology and request for forgiveness to all the women who either served on their church staffs or were in former or current congregations and were victims of one component or another of one of the “be it further resolved …” sections? Or is it the intention of this resolution to encourage these men to seek out the women (who may have been young women at the time) who came to them seeking recourse and received only platitudes – and to offer sincere personal apologies and accept responsibility? Im surprised you dd not ask Dr. Paige Patterson to sign this. I believe he would have no problem doing so. Why can’t you just read the Bible and do that? Why do you need man-made resolutions? The Bible says we are to love, honor, protect, and cherish one another. As we grow in the spirit and in our earthly marriage relationship with a spouse, we become more and more dependent upon one another and upon God for our daily needs. Yet the world sees women and men as objects to be used. Let us follow Holy Scripture in our love for one another and in our quest to live like Jesus.